If you do not like the way your lawn looks, then you should consider putting new sod down. When it comes to the delivery and installation of sod in Apopka, there are several things you should know before you have this done. When it comes to sod delivery, some companies will not offer this service unless you also hire them to install it. We at Ground Source, respect the do it yourself spirit and offer delivery only services. Whether we deliver it only or deliver and install it, we can come out and take measurements of your yard to ensure you order the correct amount. If you do not need for us to make measurements, you can send them to us, and we will be able to provide you with a price quote for the type and amount of sod you want. Whatever you decide, you can feel confident that we will take good care of you with any of your sod needs. 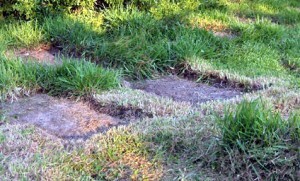 What you should know about Apopka sod delivery and installation! Before we deliver it to your home, you should ensure that your yard is prepared correctly. If you were to wait until after the sod was delivered to prepare your yard, then the grass will end up dying, and you will be wasting money. When it comes to preparing your yard, you will need to kill and remove the grass/weeds which are currently in your yard. You may need to rent or purchase special tools/equipment to do this correctly. Once the grass/weeds have been removed, you will need to ensure everything is then graded correctly. Also, at this point, you may want to consider installing an irrigation system. When you do this, you will not have to worry about watering your new grass as it will automatically be done by the set day and time schedule. 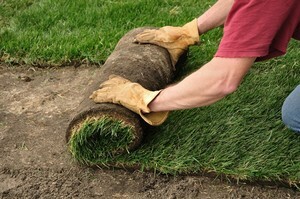 After this has been done, you can begin installing the new sod in your yard. Before you attempt to do this yourself, it is crucial that you are educated on how to properly do it to avoid injury as well as to ensure it looks good. It would be a waste of time and money if you were to do this incorrectly causing yourself harm or for you to kill the sod. If you do feel comfortable installing the irrigation system yourself, we would be more than happy to come out and this for you. We will take measurements of your yard as well as measure your water pressure to ensure we create zones that will reach every part of your yard. The sod that we deliver to your yard is cut fresh the day it is delivered so you will not have to worry about it being dead or dried out before it has been installed. 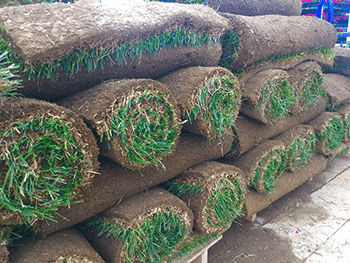 For best results, it is recommended that the sod is installed the same day it is delivered. We guarantee the freshness of the sod for 24 hours, and if there are any problems, you can contact us, and we will replace any sod which is not in good condition. If you are not a do it yourself type, we will deliver it and then install it for you. Before we deliver the sod, we will prepare your yard by killing and removing what is currently in your yard. Once this has been done, we will grade your yard to ensure it is ready for the new sod to be placed. Also, as previously mentioned, we would be more than happy to install an irrigation system before we install the new turf. We offer a plethora of different types of sod to accommodate any look and need you are hoping to achieve. If you are not sure which type of sod would work best, we can come out and discuss the various options while we take measurements of your yard. Some types of sod require frequent watering, mowing, and fertilizing, whereas other types require little to no maintenance at all. So, you need to take the time to research the various types before choosing one. If you do not do this, you may not select the right type of sod, and it will end up dying because you do not take care of it correctly. So, if you are interested in new sod for your yard, you can contact us today as we offer both delivery only, as well as delivery and installation options. Once you have met with us, you will be one step closer to having a more beautiful yard.